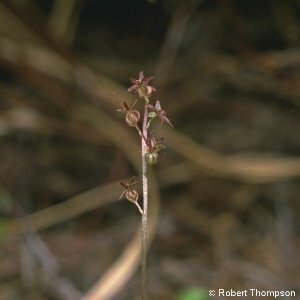 Lesser Twayblade (Listera cordata) is, in many ways, a miniature version of the Common Twayblade. 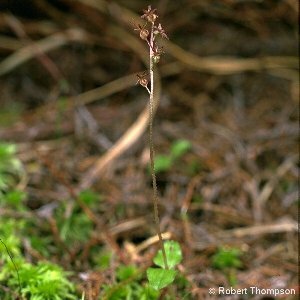 It occurs characteristically in two kinds of place: underneath heather on mountain moorland, or in woods in upland areas where it will be found rooted in moss such as Leucobryum. The plant is quite tiny and is easily overlooked, a fact which contributes to its reputation of being rare. All names: Listera cordata (L.) R.Br.